Girls! Take Off Those Holiday Pounds! You might even be able to sleep in a bit longer before standing at the bus stop. But it may drive up school budgets a tad. Since we’re on a bit of a kick talking about the Engineers lately, here’s one of my favorite pieces of their kit. As noted, the three primary missions of the Engineers are mobility, countermobility, and survivability. Countermobility is denying the enemy freedom of movement, usually by obstacles to block, delay, channelize or turn him. Common obstacles include concertina wire, anti-tank ditches, minefields, and abatis. In places where a critical road route cannot be bypassed, such as a cut through a pass, cratering the road is an excellent method of delaying the enemy. The use of explosives to move earth is something of an art and a science. Simply placing a large pile of C-4 on the road will do little. A slower “burning” explosive such as ammonium nitrate/fuel oil (ANFO) or H-6 is preferred, as it give more of a “push” than faster explosives, which are more of a “cutting” effect. Also, a cratering charge, not surprisingly, has to be buried in the ground to have any militarily significant effect. In areas of soft soil, this can be achieved with a pick and shovel. But since we’re talking about cratering a roadway, that option is somewhat less attractive. It is both difficult and very time consuming. The Army, therefore, came up with a novel system to quickly emplace and explode a cratering charge that requires no preparation of the site, only the charge itself, using off the shelf components to field a rather ingenious device. The M180 Cratering Demolition Kit is two explosive warheads and a rocket motor mounted on a tripod. Here’s how it works. Once the tripod and charges and associated det cord and detonators are emplaced, a blasting machine is used to trigger the charge from a safe distance. The blasting machine both ignites the rocket motor and a time delay blasting cap for the main 40lb warhead. 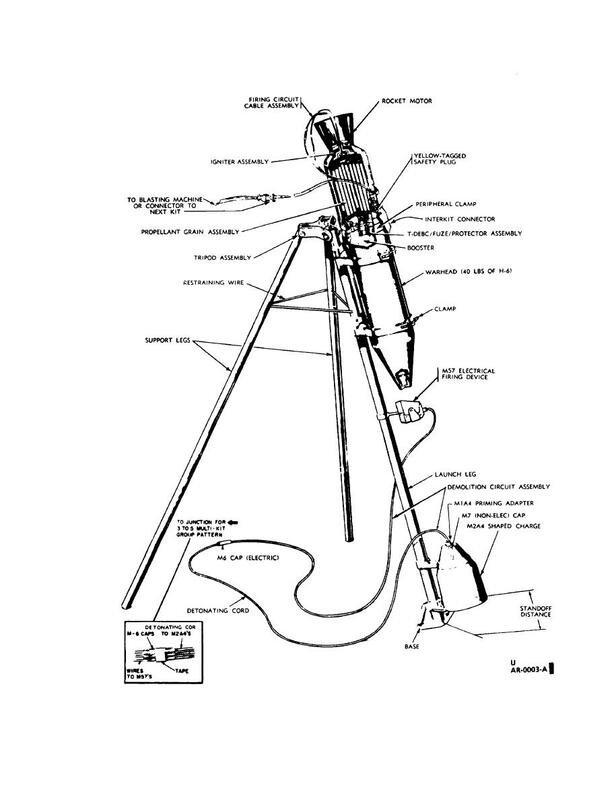 The rocket motor propels the warhead down the tripod leg. The nose cap of the warhead strikes the M57 firing device. * The M57 sends an electrical impulse to the M6 blasting cap, which sets off the det cord and the M2A4 Shaped Charge warhead. The 15 pound shaped charge warhead blasts through the roadbed and well below. The rocket, continuing along its path, buries the main warhead well below the surface. The delayed action detonators blow the main charge, and the cratering effect takes place. Typically, three to five M180s are connected and fired together to make one really big crater. I’ve had the pleasure of actually watching one in action. It’s quite the thump. But surprisingly, I was unable to locate a youtube of one in action. On the other hand, I did come across this clip of young Engineer officers performing cratering while at the Engineer Basic Officer Leaders Course. First with a hand emplaced shaped charge, they break sod, then hand emplace a cratering charge. An emplacement is one way of saying “fighting position” which is the Army way of saying foxhole. For my first enlistment, this was a small emplacement excavator. As you might imagine, digging a hole 6’x3’x6’ by hand with that is not merely unpleasant, but also time consuming. And time is the one commodity no commander can ever receive replacements for. Now, while the primary responsibility for digging an individual emplacement is always with, well, the individual, the Army also realizes that the three-fold mission of Combat Engineers is mobility, countermobility, and survivability. And nothing improves survivability like a good fighting position. And so the Army sought to field a vehicle that could help the poor grunts dig in faster. The result was the rather ungainly SEE, or Small Emplacement Excavator. By attaching several hydraulic accessories to the popular German made Unimog truck, the Engineers had backhoe/bucket loader with respectable on road speed, and theoretical off road mobility. As a grunt, I very rarely saw a SEE, but when I did, it was certainly nice to watch someone else dig a hole for me. But while I liked the SEE, it was, in my experience, pretty much universally loathed by the operators. It was quite top heavy, and aside from plowing snow, the front bucket was next to useless for earthmoving. It did however, aid in stability when using the backhoe. Entering in service in 1985, and widely fielded within just a couple years, the Army officially phased them out in 2005, th0ugh a few served a couple more years. The need for a similar vehicle hadn’t gone away, however. So the Army instead turned to the HMEE, High Mobility Engineering Excavator. Made by British tractor company JCB, the “Himmy” fulfills the same role, but on a purpose built chassis. It shares a similar layout to most backhoes, but is much faster on a roadway, while still maintaining good off road mobility. First fielded in 2007, the Army bought about 800 units. In the end though, most of the time, the average grunt will still be digging his own position.